With SBI’s PureFection™ Transfection Reagent, you can deliver more nucleic acid—plasmids, siRNAs, etc.—than the leading lipid-based transfection reagent for effective, efficient, and reproducible transfections. The easy-to-use protocol consists of a rapid, one-step, 15-minute incubation with the plasmid, small RNA, or other nucleic acid you’d like to transfect. Once the incubation is done, simply add directly to target cells—no media changes are required as PureFection works in the presence of antibiotics and serum. 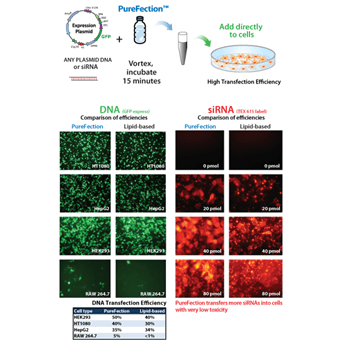 The fast PureFection protocol makes it well-suited for high-throughput transfection projects.